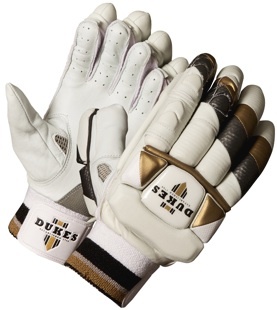 •The Dukes Patriot Ultimate batting gloves offer premium Test Match quality protection and comfort. •Traditional kapok filled sausage style fingers. •Unique 5 piece HD foam backhand section for flexibility, comfort and protection. •Ribbed fibre inserts to all fingers. •Solid finger chamber protection to lead fingers. •Two piece HD foam thumb protection. •Airflow mesh to base of thumb section. •Internal rubber thumb thimble with comfort end pad. •The softest premium English sheepskin leather palms with Pittards wear patches. •Three piece HD foam side bar protection. •Wide double sided towelling wrist bands with quick release Velcro closure. •Soft fill towelling inner lining. •Available in right and left hand. •Test Match level protection with a focus on lightweight flexibility. 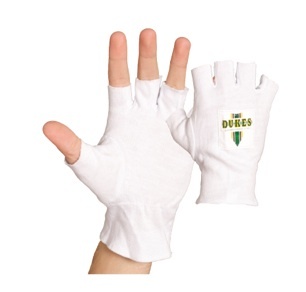 •Dual density foam protection to all fingers. •Three piece split fingers for ultimate comfort and flexibility. •Elite level protection with a focus on lightweight flexibility. •Lightweight HD foam protection with fibre inserts to lead fingers. •Multi section fingers and backhand for flexibility and comfort. •Air flow mesh for breathability. •Extra wide towelling wrist bands with velcro closure. 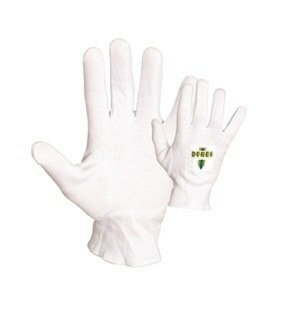 •Traditional style sausage finger gloves with cotton fill protection. •Extra wide single sided towelling wrist bands with velcro closure.